It happened in an instant. In fact, as one who doesn’t experience anxiety and is pretty calm in virtually any situation, I began to panic. There’s a horrifyingly surreal quality to suddenly becoming invisible. My family and I went to see the famed Rockefeller Christmas tree, and it was more crowded than anywhere I’ve ever been. However, because my power wheelchair has an elevating seat that places me at 5’7” tall, I worked my way through the crowd slowly but surely, eye-to-eye with those moving about, where people smiled at me, gingerly moving aside as needed for my 24”-wide power wheelchair to pass. As we got closer to the tree, the crowd became so dense that I couldn’t see the ground, merely following the heads in front of me. Then, suddenly, my power wheelchair dropped down a medium-height curb leading to the tree. Although the unexpected curb startled me, all was fine and we continued to the tree, shoulder-to-shoulder in the crowd, finishing with a classic family photo of the tree behind us. We worked our way back through the crowd, and I watched carefully for the curb, knowing that while I couldn’t climb it while elevated, I could lower my seat to standard wheelchair height and safely drive up it. As I reached the curb, the crowd continued flowing around me – that is, until I lowered my seat. Suddenly, at typical wheelchair height, my world changed. It was literally darker, more confined and, most shocking to me, I became invisible. While the crowd was moments earlier around me at standing height, now people were slamming into me, falling on me, oblivious to the fact that I was “down there.” I’d gone from a person in the crowd to suddenly invisible and of no stature simply by lowering my seat. I yelled to my fiancee for some sort of help and in a panic, I charged the curb, clipping people along the way. For me, in among the rarest moments I’ve experienced, it felt like it was life or death – I was both fighting and fleeing. Once up the curb, I quickly elevated my seat, and as people immediately began safely flowing back around me, I took a deep breath, composed myself, and realized a universal truth: Being invisible to society is terrifying. For me, that was an experience I’ve culturally known in other ways as a man with a disability. Beyond the change in physical stature I described with my elevating seat, I’ve more readily been de-elevated in social stature at times. However, the de-elevation of who we are – where we become invisible in an instant based on ignorance, stereotyping and discrimination – is a disturbingly universal one. Imagine how it feels as an African-American trying to hail a cab in a big city, and empty cabs pass you by. Imagine being gay at a dinner party where rhetoric arises, condemning homosexuality. Imagine being a woman shopping for a car, and the salesman only speaks to your husband. Imagine walking into a clothing store as one of a plus size, and the sales people ignore you. Imagine being in bed with your spouse, and he or she turns his or her back to you as you’re trying to communicate. Or, imagine being homeless on a Los Angeles sidewalk, and no one even looks at you as they pass. So many of us can relate with being de-elevated to invisible. 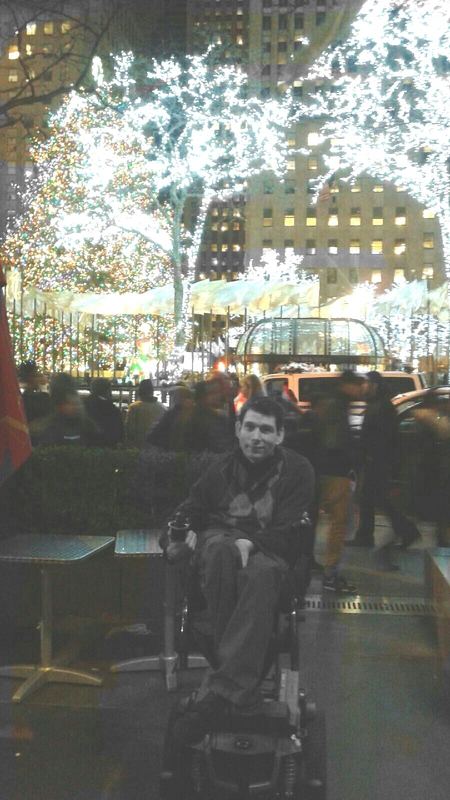 Yes, I was fortunate amidst the crowd at Rockefeller Center that eve because, at the touch of a button, I elevated back to being seen. However, life for many – including me as one with a disability – often isn’t so easily resolved. When we’re dismissed by others and made to feel invisible, there is no button to push. Rather, the experience of being made invisible based not on our character, but based on the ignorance, stereotyping and discrimination of others… well… just hurts. to it regarding purchasing a car. Suddenly I’ve become an elderly woman in a wheelchair … Ha…glad my earlier years have let me develop thick skin, except recently when I expressed my opinion among some younger folks and was told to go to Pinterest or the Senior Center as my thoughts weren’t in keeping with the times. That smarted. Mark, wow! Your story gave me chills. I try to suppress memories of those kind of moments. And, thinking about it, it usually involves crowds. The most amusing scary crowd story is when I was still using a manual chair. My then girlfriend and I were at a local theater to see Devo. This was close to the peak of their popularity. Enough seats had been removed to create a dance floor. I was kinda close to the stage on the side. Everything was fine until they hit the stage. The crazed Devo fans rushed forward. That’s when my panic set in. Fortunately, spotted an emergency exit close by. It had a couple of stairs so I threw myself out of the chair, scooted up them to the sidewalk while yelling at my girlfriend to bring the chair. The oversize bouncer guarding the exit from gatecrashers started to give me a hard time but I was entirely too pumped with adrenaline and anger to let him say more than a word or two. We went back in and watched the show from the back. It was great!